Upgrading of the ballast, track (U33 Rail on UIC 54) and sleepers (EA and S40 on Bibloc VAX-31). The project also includes adjustments to the alignment and rectification of curves in order to increase speed up to 120 km/h. 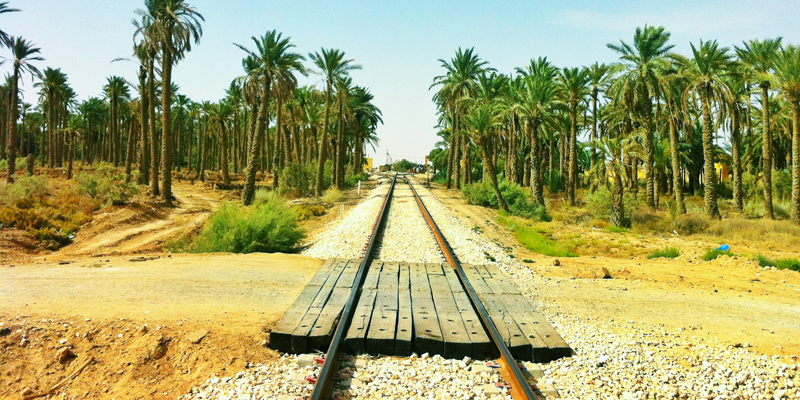 Along El-Gourzi-Biskra section, 75,000 m3 of ballast were replaced and 29,725 m of track and 48,500 sleepers were laid out, along with 7 switch gears and 4 expanders. 948 exothermic welding and 2,413 electric welding works were also carried out. Besides, along Biskra – Touggourt section, 451,046 m3 of ballast were replaced and 230,456 m of track and 379,693 sleepers were laid out, along with 69 switch gears and 4 expanders. 22,328 exothermic welding and 4,257 electric welding works were also carried out.